They say Labor Day marks the end of Summer. Ha! They don't live in Middle Tennessee where some of our hottest days come well into September and we don't expect the first breath of Fall before October. Nevertheless, it's still nice to live in a place with four distinct seasons. I made good use of the final hot days of August with a couple of finishes and one near finish, thanks to a S'mores slow/no-sew day at Kristen's Craft Cottage. The second/final border is on Mary's Triangles and the binding prepared. I'll put the two back pieces together this week and it will be ready to file away for quilting. The flimsy for S'more Blue went together quickly after laying it out on Wednesday. I'll work on the back and binding this week then it may go to my LAQ. I'd like to see what she will do with the raw edge center 4-patches. I also managed to get the center of Easy Street together and have cut inner border. If I can get the borders on this week, that will be another UFO off my list. Whew! The negative net used is shrinking, but there's the AQS Chattanooga show next week. I will try to be good. Wouldn't you be envious of this dedicated space? S'mores had a slow/no-sew day at Kristen's Craft Cottage yesterday. At the end of the day we didn't want to leave this sweet cottage tucked under the trees. When Kristen decided to take up scrapbooking in addition to quilting, she quickly outgrew the second bedroom in their already cozy house. Her solution: a 20 x 20 Amish-built shed. One half is dedicated to quilting. Kristen makes the most amazing cards so the other half is dedicated to stamping and scrapbooking. You are probably wondering, "What does a S'more do on a slow/no-sew day?" Kristen assembled storage cubes for her growing stamp collection, Donna crocheted coasters, Shirley knitted on a blanket for a new grandchild, Nancy pinned Smith Mountain Morning units, Frances did some hand-piecing, and I hung two flannel-back tablecloths to lay out S'more Blue and Easy Street. All-in-all, a lovely day with lovely friends in a lovely setting. And we got a bunch accomplished! Success. All borders are on Mary's Triangles. There were quite a few blocks leftover so I thought to throw them together in a little quilt. Well, at 5x8, 4" finished blocks make a VERY little quilt. Not wanting to waste my effort I decided to add a very large border. But my strips are not wide enough to go across without piecing! Why is it that something which should be quick and easy turns into a major headache? I realized why these blocks had not made it into the big quilt -- the workmanship on them stank/stunk/(expletive deleted). So please don't look at it "up close and personal." Nevertheless, I hope this little quilt will comfort someone, a child maybe, somewhere along the line. Two other projects would be on the wall except they are already packed for a slow-sew day on Wednesday. Kristen has said I can put up a big design wall in her "craft cabin" to lay out Easy Street and S'more Blue. It was a productive week in the sewing room, but no finishes to count out, unfortunately. I settled on a border fabric from my stash for Mary's Triangles, but only managed to get the sides on. My "studio" is in the basement and I have to come up to the main floor to lay large things out on the dining room table to measure (which, I might insert, is not as bad as going up two flights of stairs to get to the printer). I have cut the last two borders and they are poised, along with the top, next to the machine ready to stitch today. At our retreat the previous week, Lisa was working on projects from the Loose Change book by Kansas Troubles. They use charm packs and layer cakes (and those smaller pieces that I can't name). Having received several charm packs from my secret sister, I was anxious to try the technique. So in a matter of days I made 48 blocks just waiting for a large design wall to lay them out. The best part: I cut a bunch of 10" squares from my stash! Then I decided to was shamed into dragging out Easy Street -- <groan>. It was (long overdue) time to decide what could be done with the pieces-parts I had already finished. Eureka! I discovered I had 6 B blocks finished. Also 4 A blocks finished and the rows for 5 more A blocks pinned together. The 4 corners were done, as well. Plus all the individual units made for the side setting triangles. I could do a straight setting with the finished blocks, but that would leave a pile of miscellaneous units in colors I'm not fond of. Or I could do an on-point setting on a smaller scale that would require finishing at least one more A block and making some side setting triangles. In the end I finished the remaining A blocks, assembled 8 side triangles, and chose borders from my stash -- just waiting for a large design wall to lay them out. Stash Report: Nothing in, nothing out..... yet! Yesterday the Queen Mother's sitter spied an armadillo ambling up the back hillside. Part of me was hoping to catch sight of the beast -- the other side of me said "ick!". I have no idea if it's taken up residence or was just passing through, but was keeping an eye out the windows the rest of the day. Then I spied it! From the kitchen window I snapped a quick pic, in case my going outside would scare it off. I quietly snuck down the deck stair and across the driveway. This armadillo wasn't going anywhere! A Rock and a Stick! Although I scoffed at the "modern quilt movement" when I first heard about it, I find myself drawn to this style of quilt -- both the simplicity of design and fabrics. So I started a "modern" quilt last week. I just took time to make one block to be sure I wanted to move in this direction (ouch, no pun intended). The pattern is Cursor by Natalia Whiting Bonner and Kathleen Jasperson Whiting (American Quilter, September 2014). I think I will name this one "Which Way Did He Go?" in honor of the armadillo. You can check out other design walls at Patchwork Times. Rats! No, not the living kind. I'm just disgusted that all my effort at stash-busting last week at retreat was offset by more purchases and some gifts. I reported here about my finishes at retreat. True Blue (in Black and Cream) used up 11-2/3 yards for top, back, and binding. Elegant Garden accounts for 10-3/4 yards, top and back. Have you ever wondered why we don't say "top and bottom" or "front and back"? -- I digress.... Mary's Triangles, top as it stands, used 4-1/3 yards. I may put a second border on it, but I'm counting without the border for now. Gifts from my Secret Sister included two Moda Charm Packs and a cute panel, "HandMaids" by J. Wecker Frish for Quilting Treasures. Their website describes it as "steam punk inspired." Each panel is about 7". I would love to do something "public" with them, like a bag or jacket. Any suggestions? A very sick friend shared her stash of s'mores fabric with all us. A S'more can never have too much s'more stuff! That added a yard and a half. Then I purchased 6 yards of wide back fabric, a yard for potential border for MT, and a bit more Grunge for my modern quilt. At least I used more than I took in. Oh, the armadillo! QM's sitter saw one lumbering up the back hillside when she went to take the trash out this morning. I knew they were heading this way but never expected one in my yard! I would like to see it -- but, then again, maybe not! This post will simply be a little show of the quilts other S'mores were working on and/or finishing this week at retreat. Please understand the lighting is not always the best and getting a good shot without clutter in the way is nigh impossible. My tablemate, Sharon, has limited space at home so she uses her retreat time for borders and backs like I do. She got several UFOs off her list. First she finished assembling her Scrappy Sister's Choice, including a double border which I failed to photograph. She got the final border on her Easy Street, as well. And she worked so fast and well into the night that I missed a couple of finishes. 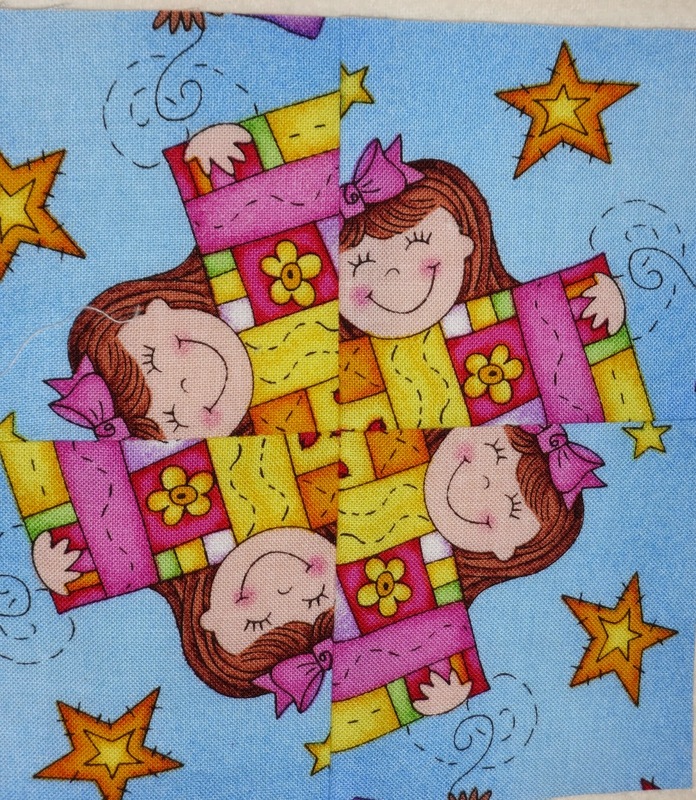 Lisa is probably our most prolific quilter. She has a high speed machine and a mind that runs even faster. She made a couple of iron carriers and quilted a table runner before I could get my camera out of the bag! She spent a couple of days working with Kansas Troubles' Loose Change. Such fun projects. And managed to lay out and assemble a sampler of blocks we exchanged last Christmas. Deanna had a couple of finishes, including the borders on her Women of Courage. 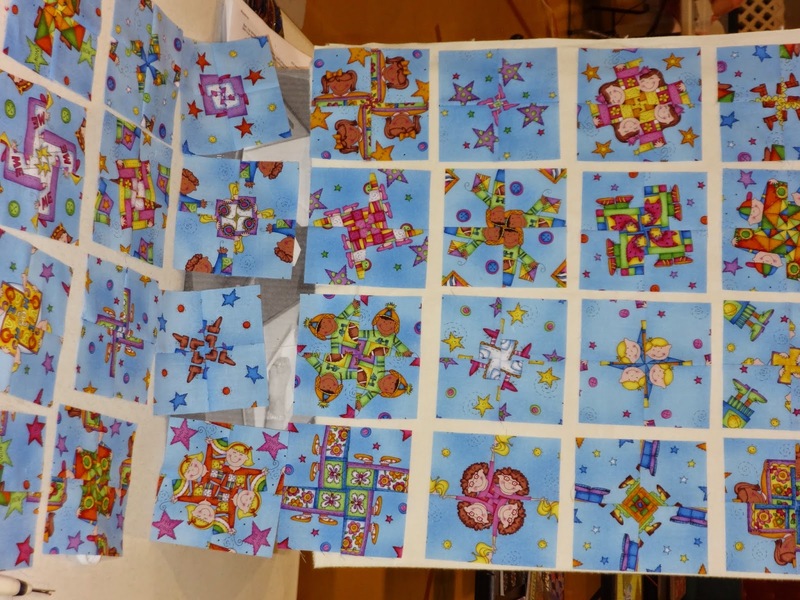 Rita spent her time working on a pictorial quilt to hang at Pennyrile State Park in Kentucky where their guild has annual retreats. Frances made a modern log cabin in Amish colors. Then she dove into her first attempt at One Block Wonder. It has very subtle coloring, but will be so lovely when all the blocks are made. Shirley is very focused. She managed to finish two projects from scratch and put a border on a UFO. Sandy took time out of her busy week to show us her Overhand Knot from Peg Bingham's class the week before. Lucille came all the way from North Carolina to be with us. She spent her time working on Twisted Bargello, but didn't get far enough along for a photograph. Donna finished her Christmas tree quilt that she started last year, then began working on a 30's project, the name of which escapes me. Kristen had to work a day at her EMT job, but still managed to finish a colorful rail fence variation. Diana was a late arrival and used her time to clean a couple of her newly-acquired Featherweights. Ever seen a pink free-arm? Becky worked on receiving blankets for her first grand baby. Sorry, Beck, I didn't think to photograph the classy flannels you were using. Nancy plugged along on Jared Takes a Wife. And Charley worked on Rock Island Campfires. It was her idea for the Rock Island Rockers to make these and she's the last to finish! Harrumph. Thought I took pictures of these but can't find any. Ari, also plugged along on Jared Takes a Wife and by the end of retreat she had decided Jared just needed a live-in. Frustrated by how long it was taking, and unhappy with the setting, she held an early-morning coffee klatch. This is the solution we arrived at.. Yes, we got a lot done. But the best part -- the most important part -- of retreat is the companionship and camaraderie, the release of laughter, and the refreshment of just "being." A Happy Dance is definitely in order! The S'mores retreat this week was one of our best -- lots of hugs, reconnecting with distant friends, super projects in progress, and no drama. The only thing that would have made it better is if all 20 of us had been present. But life does tend to get in the way sometimes. I went with high hopes of completing some UFOs -- and I DID! First, I completed a couple of guild project blocks. (Apparently I failed to get a photo of them.) I have been doing a back-to-basics series this year and for each lesson I prepare two blocks -- one I finish to put on the board and the other I leave in pieces to demonstrate parts of the construction process. Once I've done the demo I finish up the second block. 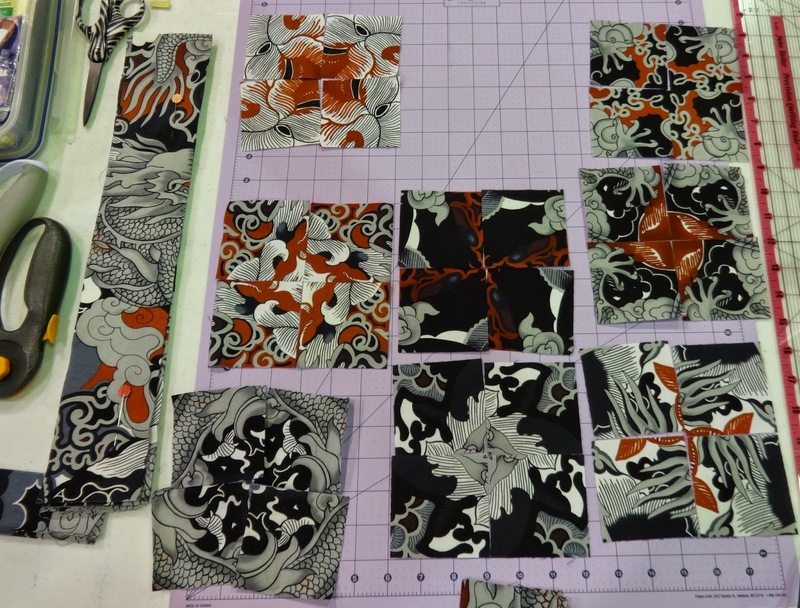 Next I stitched together some quarter-square posey blocks from a wild-and-crazy panel series. They are far from perfect because little panels are never perfect. Still, they yielded interesting results. I plan to use a simple sashing and call it a quilt. The blocks will finish about 6" so it will make a nice child's quilt, don't you think? Next up: True Blue. This is a pattern by Carrie Nelson that appears on the cover of her Miss Rosie's Spice of Life Quilts. I made mine with mostly black and cream batiks with a few black/multi batiks thrown in. I love the graphic nature of it! All I needed to do was add the last border and make the back and binding. I generally save those details for a retreat where I have large tables at my disposal. One UFO off the list!!! Followed by another UFO, Elegant Garden. 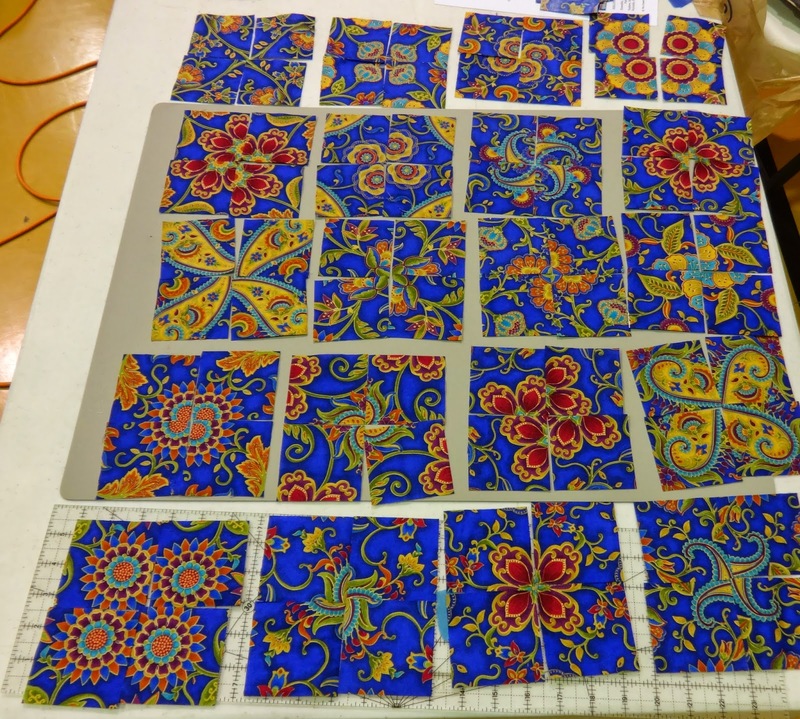 The pattern is in 40 Fabulous Quick-Cut Quilts by Evelyn Sloppy. All it needed was a border -- or so I thought. I managed to make it far more complicated with four borders and, to top it off, I mitered them!!! This took far longer than I had anticipated, but I think it needed that. I also cut the back. I will need to make a little adjustment in one of the corners before it gets quilted. This one is staying with me! My next project was intended to simply lay out and pin the rows to sew at home -- supposed to take just a little bit of time so I could move on to something new. You know how it is -- first you want to see how it will look and then you can't find a good stopping point. I had originally planned to do something interesting in the corners but in the end I decided to just continue with the concentric diamond design. By the end of the day I had Mary's Triangles completed except for an outer border. So Mary's Triangles is almost complete. It just lacks a final border which I had not taken with me since I wasn't supposed to get that far. And with just a few hours remaining I set about a new project, something very modern. Tune in next week to see how that is going. Tomorrow I'll give you a glimpse of what everyone else was working on. The S'mores are holding their semiannual retreat this week. Seventeen of the twenty are expected to be there. We have had a number of family crises within the group -- it will be great just to be together, hug, rest, and catch up with each other. We might even get some sewing done! I will be taking two projects that just need borders and backs. I usually reserve this stage of a project for retreats where I have the advantage of large tables to lay out, measure, and pin. I also have a couple of projects that need a large design wall. I may do no more than lay those out and pin the rows to be sewn at home. My design wall at home is just a small flannel-back tablecloth, about 40" wide, which limits the size of what I can lay out at one time. And, finally, I'm going to start something new! It's very modern and not my normal style, but I can't wait to get started on it. I'll be linking up with Connie at Freemotion on the River for Linky Tuesday. It's always fun to see the great projects other have completed or underway. 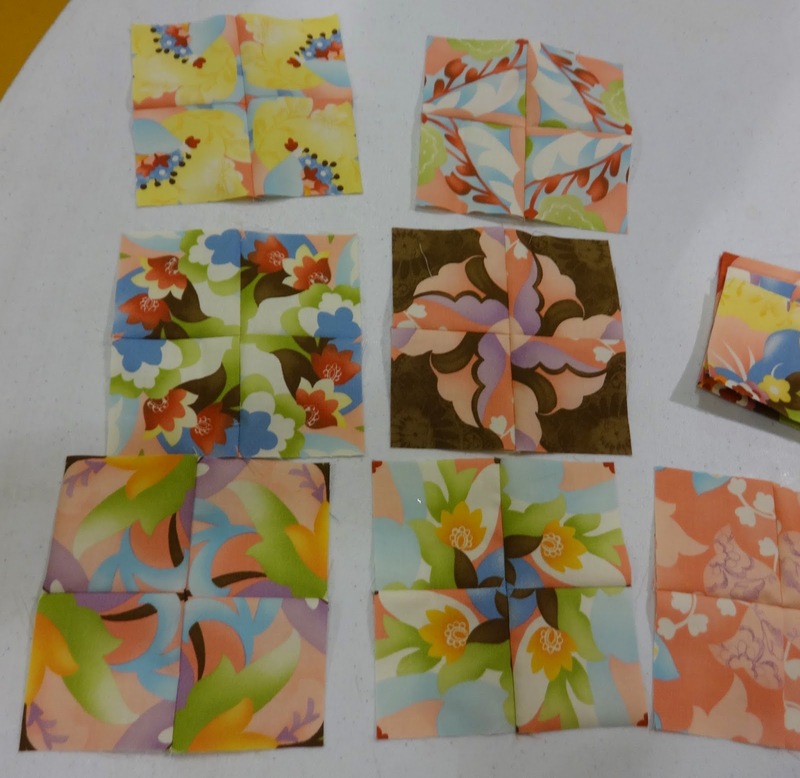 I led a class in 4-Patch Posey at a local guild on Saturday. It was such a delightful day -- so fun to see everyone's excitement as the posies revealed themselves. Lots of variety in the fabrics yielded amazing results. Probably the most interesting was this very large-scale dragon. I felt like there was enough detail in the large areas that the results would be great. And look! One fabric I had my doubts about (oh, Me, of little faith!) was a juvenile print with kids holding quilts in it. I had visions of chopped up faces and legless bodies. I wish I had taken a picture of her starting fabric because this is what she came out with. So sweet! It will be a child's quilt for a little boy. 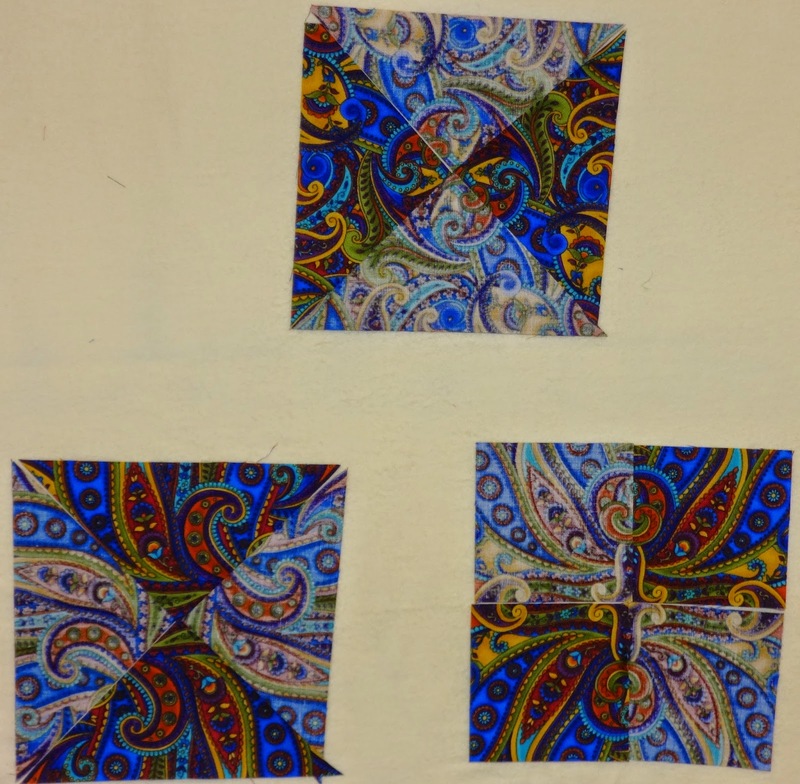 Two ladies were using the same paisley fabric -- very vibrant colors and interesting results. This student had a remnant with tightly-packed motifs and a very short repeat (about 6"). 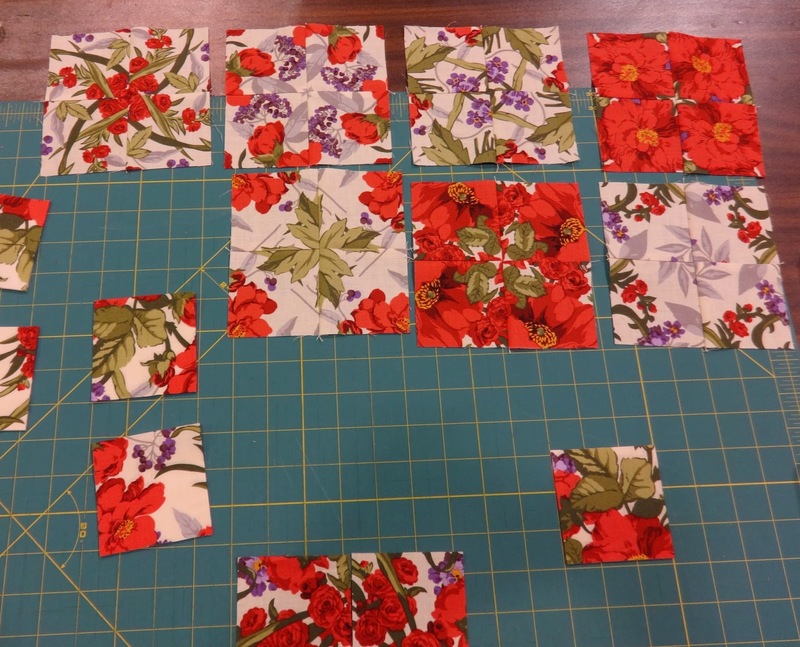 She was able to get 4 repeats out of the remnant and created these five blocks. 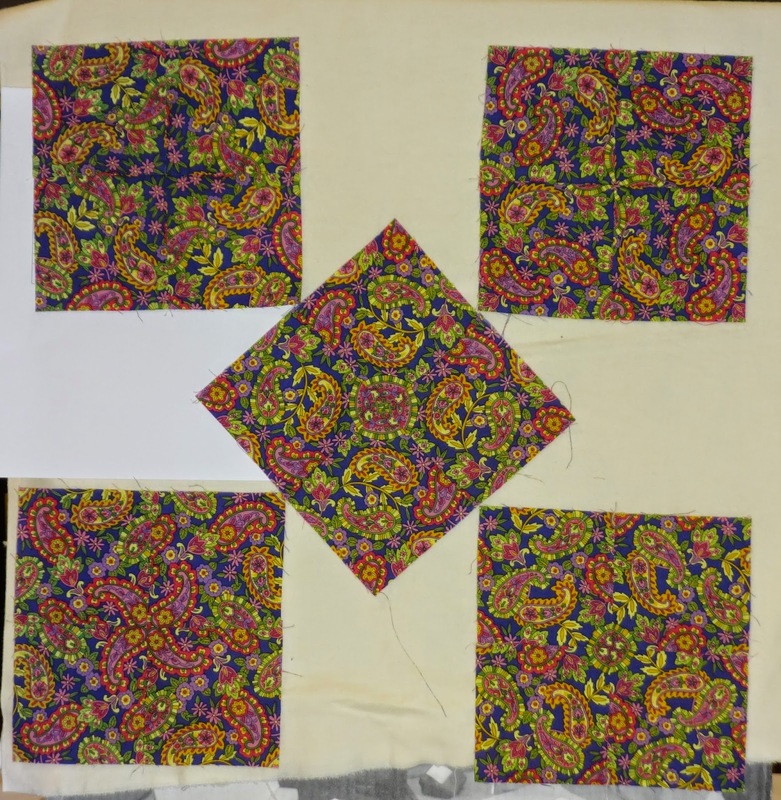 In addition to the traditional 4-patch posey, I demonstrated how to do quarter-square triangle posies and mirror-image posies by turning the fabric over. 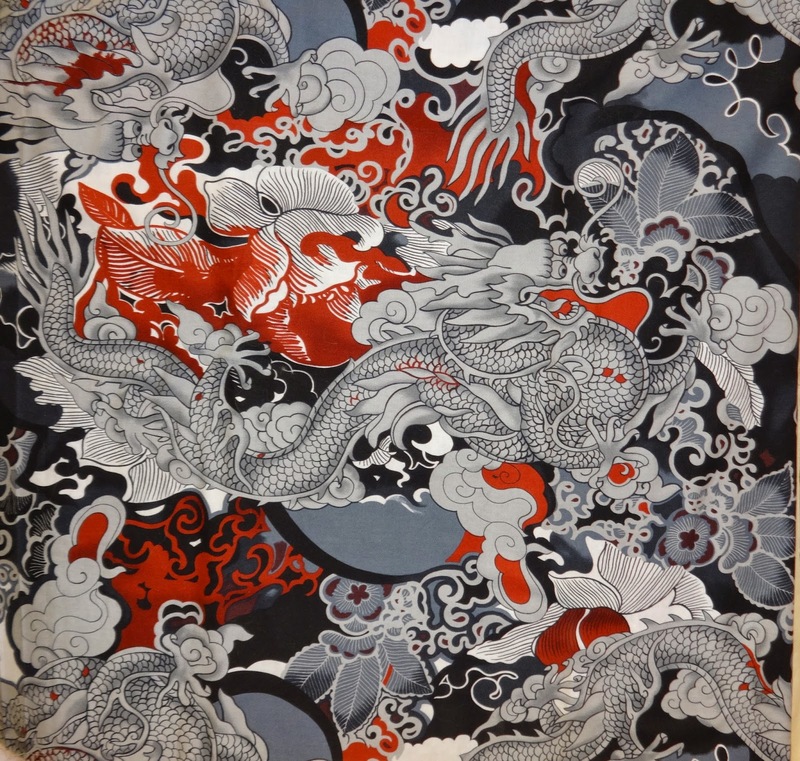 Paislies seem to yield sure-fire success, so as a door prize I gave away 1-1/2 yards of this luscious paisley. How do I spell R-E-L-I-E-F?